New Parent? 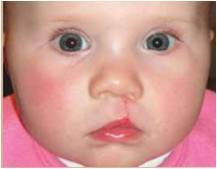 Have a new baby with a cleft lip? 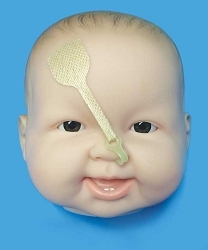 Order the DynaCleft New Baby Pre-Surgical kit for all the items you need to best prepare your child for surgery. The kit includes a 10-12 week supply of positioning strips and nasal elevators, free shipping and a free cleft lip NutriSqueeze bottle. Providers: We now offer the DynaCleft 2-week Start Kit you can provide new parents to introduce them to the DynaCleft system. 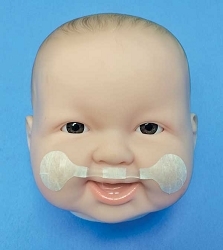 This kit includes extra strips for parents to learn and practice how to apply the DynaCleft system, and additional information on ordering the supplies needed to prepare for the first cleft surgery. 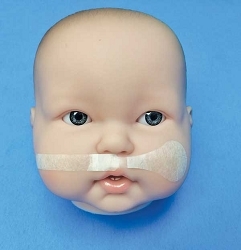 Developed in collaboration with plastic surgeons, orthodontists, and cleft palate teams, the DynaCleft® System gently guides and supports facial tissues to improve nasal symmetry and better position a cleft lip and palate for optimal surgical results. The DynaCleft system is comprised of two components, the DynaCleft® Positioning Strips and the DynaCleft® Nasal Elevator. Each component can be used independently or together, or in conjunction with a NAM or intra-oral plate for the best possible surgical results. The DynaCleft Positioning Strips come in a unilateral or bilateral version. 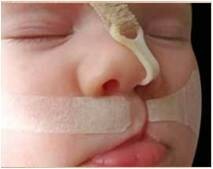 During the first 6-8 weeks, the DynaCleft Positioning Strips should be changed every day, and then may be changed every 1-2 days until the cleft repair surgery. The DynaCleft Nasal Elevators can be changed every 2-3 days. To order or learn more about a specific item, visit the product pages below. The DynaCleft system simplifies and improves the pre-surgical positioning of the lip and palate for improved cosmetic and functional outcomes. Easy to use at-home and does not interfere with feeding. No professional adjustments required, and fewer clinical visits. Non-invasive treatment maximizes baby comfort. Re-positional adhesive minimizes baby skin distress. Elastic strips expand and contract with baby's movements for optimal treatment and comfort. For more information, download a DynaCleft Positioning Strips + Nasal Elevators brochure. For purchase orders (POs) or institutional ordering, please fax your orders to 303-480-9115, email them to order@craniorehab.com, or call us at 1-800-206-8381. To order direct for a patient, DynaCleft Positioning Strips + Nasal Elevators require a prescription. Download our DynaCleft Positioning Strips + Nasal Elevator Rx-Order form to prescribe the system or to bring to your doctor. If your doctor recommended the DynaCleft system, contact us and we will help you obtain the appropriate Rx. Have a prescription for the DynaCleft Positioning Strips or Nasal Elevators? Order through the website via the product pages below and upload a picture of the Rx with the first order. Call us at 1-800-206-8381 to place your order. Or email a copy of the Rx to Order@craniorehab.com. Include your name, address and phone number in the email. We will then call you for your order, or simply order through the website below. Or complete the web form on our page Order from an Rx, and we will get back with you. Or fax a copy of the Rx to 303-480-9115. Include your name, address and phone number on the coversheet. We will then call you for your order, or simply order through the website below. If you are interested, and would like us to contact your doctor with more information, please call us at 1-800-206-8381 or complete the web form on our page Order from an Rx. Insurance coverage: Currently there is no coverage for DynaCleft® Positioning Strips or Nasal Elevators. We are working to improve this coverage. We do provide a form letter you can use to request reimbursement from your medical insurer. These items are also eligible for HSA and other health saving spending plans. DynaCleft® Starter Kit of the DynaCleft system.